It’s not very often that I find myself agreeing with a likely overpaid analyst, especially one who admits that they have no “inside information”, but I think Ezra Gottheil of Technology Business Research could be onto something. Gottheil is predicting that Apple will announce its own Netbook at Macworld in January, priced higher than its competitors, that will, like the iPhone, run a new version of its OSX operating system, and will be similarly tied to an iPhone-esque App Store and iTunes for third-party software downloads and system upgrades. 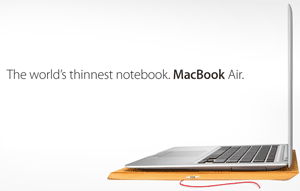 An Apple Netbook is a necessary product in what looks like a very deep recession. Having said that, Gottheil doesn’t think Apple won’t go for the low, low-end but will price the device at around $599. By offering a device that runs a significantly cut-down version of OSX compared to that which runs on the company’s existing Mac laptops, presumably optimized for a smaller screen and ‘cloud’ computing, an Apple Netbook won’t cannibalize existing sales of its higher-end product line. Furthermore, like the iPhone and iPod touch, the third-party ecosystem would be tightly controlled by Apple via a dedicated App Store, ensuring that any cut in margin for the Netbook itself would be, to some degree, offset by the company’s share in revenue generated by third-party applications. Likewise, any ecosystem around third-party hardware would also be controlled by Apple a la the existing ‘Made for iPod’ licensing program. Synchronization and backups would be handled by MobileMe, Apple’s existing ‘cloud’-based suite of applications. “By controlling the software that can be loaded and the hardware that can be attached, Apple’s device will be simpler, easier to use and more reliable than a PC, and will excel at the functions most required by users,” says Gottheil. Update: It’s now pretty much certain that there will be no Netbook announcement at Macworld, or any major new Apple product unveiling (an updated Mac Mini perhaps?). That’s because the company has announced that Steve Jobs won’t be delivering a keynote speech, and that Apple is bailing from Macworld as of next year altogether. However, when/if Apple releases a Netbook of sorts, Gottheil’s prediction of a ‘closed’ system with third-party apps only available through an Apple-vetted App Store still makes a lot of sense. It would be interesting to have a netbook with Mac on there. You can already do it with OSX but that’s illegal. It would also be interesting if this netbook supported touchscreen! A lot of iPhone users would love it. There’s certainly pent up demand for an Apple Netbook that’s for sure. On the issue of ‘touch’, I’m not convinced that it’s need for a traditionally shaped clam shell notebook, I just don’t see the appeal of leaning over and touching the screen. A tablet form-factor maybe, but tablet PCs haven’t sold well. I don’t believe they could pull that off without changing the form factor. The would need an excuse to lock it down. A tablet may be feasible, but a traditional notebook format would just mean constant comparisons to other cheaper netbooks or more capable macbooks. It is true however that with the mac mini left to gather dust Apple have been ignoring the low end for a long time.